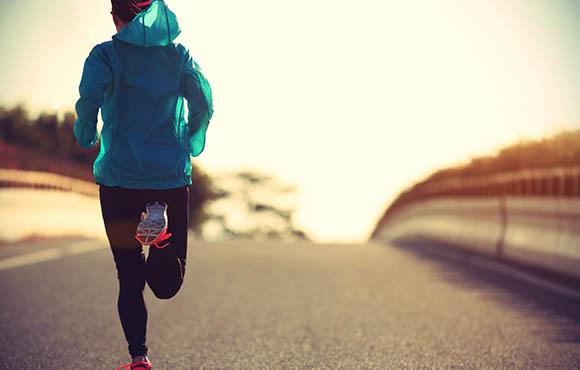 Running can be a very effective way to keep fit and can be tailored to suit all fitness levels, however for those with pelvic floor problems it can be challenging. This information does not seek to endorse high impact exercise with pelvic floor dysfunction but it recognises that many seek to continue to enjoy running throughout life, manage their symptoms and strive to prevent a worsening of existing pelvic floor problems. Can running cause and/or worsen pelvic floor dysfunction? The answer is “Yes”. Running is a high impact sport – meaning both feet being off the ground simultaneously. When the heel strikes the ground during running, the physical force associated with landing passes down through the pelvic floor and then to the ground via the lower limbs. This repetitive action can have the effect of stretching the pelvic floor muscles and connective tissue supports. It can be damaging if the necessary muscles and supportive tissues lack the strength to withstand the associated impact. The forces a person exerts on landing as well as their running style are also key components. A daily pelvic floor exercise program will help to optimise your strength and support for your pelvic organs (including bladder, uterus and bowel), making them more resistant to the repetitive downward strain. You are aiming to train both fast twitch and slow twitch fibres within the muscles, three times daily for up to six months. For more detail and instruction read the ISCP advice, search for Pelvic floor exercises ISCP. Depending on the problem, there are devices and support garments that may be beneficial in controlling symptoms and providing additional support. Your GP, Gynaecologist or physiotherapist could advise you on their suitability enabling you to remain active. The weight of the upper body and abdomen is transferred directly to the pelvic floor during high impact exercise such as running. Being overweight or gaining weight will place further strain on your pelvic floor. Running surfaces such as gravel, sand and grass as opposed to cement or tarmac can help to reduce the impact associated with running. Continually running on hard surfaces can cause higher impact on the pelvic floor. Consider water running as this markedly reduces strain placed on the pelvic floor during running. Long stride length increases the impact of running. A shorter stride length will keep hips more above the foot on impact and may reduce the potential for joint and tissue strain. High speed running is more likely to cause greater pelvic floor impact and downward pressure on the pelvic floor so slow down your speed wherever possible. Repeated impact with running will increase the likelihood of pelvic floor connective tissue fatigue, strain and ultimate failure. Try to alternate your running distances to include short distance runs and avoid repeated long distance road running wherever possible. If you’re a beginner or returning back to running after a while out, start slowly and build your distance therefore allowing the pelvic floor muscle to gradually adapt to the increase stress. Listen to your body and build up your endurance gradually, when you experience symptoms stop. Running downhill has a tendency to cause you to over stride and therefore increases the impact and strain on the pelvic floor. Stick to running on flat surfaces where possible and try to land softly to lower stress on impact. Choose other alternatives to running on a regular basis. Seated cycling with low resistance either stationary or outside and deep water running can provide a great ‘pelvic floor safe’ cardiovascular and resistance workout. Programs to train and strengthen deep inner muscles are important to manage the challenge of running. Well cushioned running shoes are vital for reducing impact when running and aim to protect the joints and tissues of the pelvis and lower limbs. During pregnancy ligaments and joints become more flexible in preparation for childbirth. There is also further strain placed upon them from postural changes during pregnancy, the mother’s increasing body weight and the weight of the growing baby. This may be a time to choose low impact exercise eg. walking, swimming, pregnancy pilates or yoga to maintain health and fitness and protecting your pelvic floor. This is particularly important if you experience low back or pelvic pain. If choosing to continue to run, consider the strategies mentioned above and listen to your body. Following childbirth the pelvic floor is weak and lacking support owing to the combined effect of: the strain of pregnancy, childbirth, altered hormones and physical fatigue. Postponing returning to running, allowing yourself time to heal and rest and focusing on deep core muscles and low impact exercise are advisable during the first few months. This may allow a reduction in weight gained and corresponding strain on pelvic tissue as well as an increase in energy levels. This may be particularly relevant for those post caesarean birth, third and fourth degree perineal tears, infection, prolonged second stage labour with intervention, diastasis separation, persistent pelvic instability, coccyx damage, prolapse or incontinence. Rehabilitation varies depending on the surgery performed and any issues that may have existed prior to surgery. Similar to pregnancy, post surgery, particularly gynae surgery, is a time when the pelvic floor is vunerable. It is advisable to start with low impact exercise eg. easy walking on level ground and gradually increase intensity as strength and fitness improves and remembering to include a deep core program. Be guided by advice from your surgeon and physiotherapist and above all listen to your body. I hope this information helps you to stay healthy, well and continue your enjoyment of running if that’s what you love to do. If you require any further advice or individual assessment please do not hesitate to contact me, Fiona McGoldrick Women,s Health Physiotherapist Aut Even Hospital on 056-7775173.